InterConnect Manager Add-On for SAP Business One is an administrative tool used by the Portals. It's used to manage details such as user settings, menus, roles, and web configuration. Start the Add-on Before doing any configuration for Customer Portal, or B2B Marketplace. InterConnect Manager Add-On only needs to run while administration tasks are being completed. The add-on is not needed for users who do not regularly perform admin tasks, so typically a “manual” startup is required as described below. If a user requires access to InterConnect Manager Add-On often, enable per-user admin settings so the add-on starts automatically for that user only. 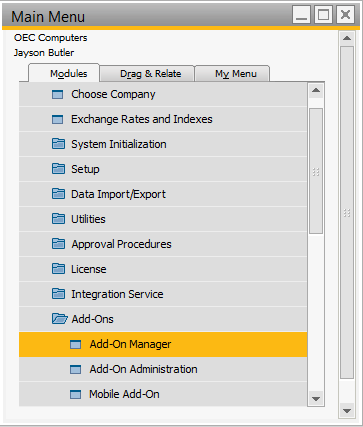 Open Administration > Add-Ons > Add-On Manager in SAP Business One, as shown below. In the SAP Business One Administration Menu, select Add-Ons and open the Add-On Manager. Open the Installed Add-Ons Tab (see marker 1 below) from the Add-On Manager window. 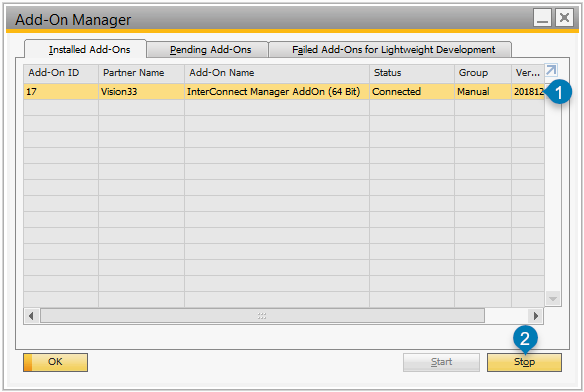 Select InterConnect Manager AddOn and use the start button (marker 3 below) to start InterConnect Manager Add-On. This may take several seconds to start. From the Add-On Manager, open the Installed Add-Ons tab, select InterConnect Manager Add-On (1) and press the start button (2) to start the add-on. 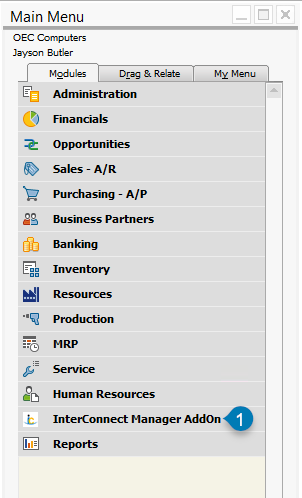 When InterConnect Manager Add-On has completed start-up, a menu entry will be displayed in SAP Business One (see marker 1 below). 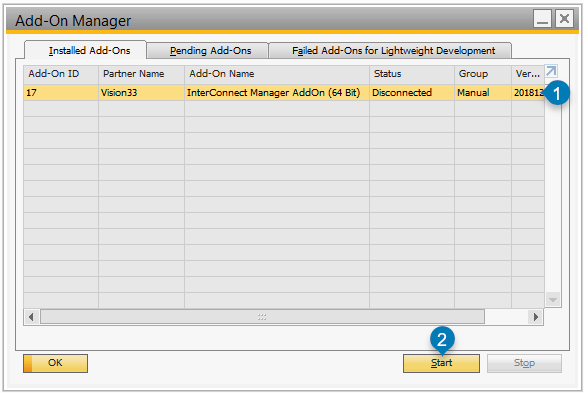 When InterConnect Manager Add-On has been started, a menu entry will be displayed in SAP Business One (1). Once InterConnect Manager Add-On is started, it can be stopped by using the Stop button in the Add-On window in SAP Business One, shown below. When started, view the Installed Add-Ons tab and inspect the add-on's Status column (1). Use the Stop button (2) to stop the add-on if it is no longer needed.